Life has been hard for Chloe Hardwick, the heroine in my newest release, Unbuttoning Miss Hardwick. She’s looking for a little stability and security in her life, and she’s found that she’s more likely to get it when she hides behind a mask. Not a literal mask, but one made of a calm demeanor, incredible efficiency, a uniform of heavy, unattractive clothing and a line of shining gold buttons. As assistant to Lord Marland, the Marauding Marquess, her disguise allows her to hide safely away while molding herself into becoming what her position demands and what her employer needs. She excels at her work. It’s not until she realizes that she’s coming to have feelings for her employer that she begins to rethink her choices. For how can she expect Lord Marland to return her feelings when he has no idea who she is? When she has no idea who she is? She finds she has to leave in order to discover the answers to those questions. Now, I don’t believe that I’ve ever hidden myself away as thoroughly as Chloe does, but I have some sympathy for her, as I have reached certain points in my life at which I’ve had to make hard decisions. Decisions not only about which path to follow—leaving a mainstream career behind for mommy and writer-hood, for example—but also decisions about the kind of person I want to be. I’ll share a hard one with you all. When I was a young adult, I found I had to take a long look at a person of importance and influence in my life. This person was often distant and detached, but also extremely witty and sarcastic. I found I could find favor by adopting a cynical, cutting and sarcastic manner myself. I grew to be good at it, too. And every approving chuckle felt like a validation. Until I realized that was not the sort of validation that I really wanted. Until I discovered that I didn’t like myself that way. Until I realized that being hard and cynical is a lot of work when it is not your natural state. I wasn’t comfortable behind that mask. So I made the conscious decision to abandon the sarcasm and be true to myself. I’m much happier being open, looking for the best in a situation. I’d rather be hopeful than guarded. In truth, I think we are both better off. So I’ll ask you: Have you ever hidden yourself behind a mask or a disguise? Have you made a conscious choice to change something about yourself? Are you cynical? Or an optimist? One randomly chosen commenter will win an autographed copy of Unbuttoning Miss Hardwick. Deb Marlowe adores History, England and Men in Boots. Clearly she was destined to write Regency Historical Romance. A member of RWA, the Heart of Carolina RWA and the Beau Monde for nearly 15 years, she’s won the Royal Ascot and the Golden Heart and has been nominated for a Rita. 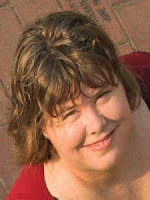 She sold her first book to Harlequin Historicals in 2006 and her newest, Unbuttoning Miss Hardwick releases in June 2012. She is a director of the Raleigh/Durham satellite of Lady Jane’s Salon. She lives in North Carolina where she spends her days with the people in her head and her evenings with her wonderful husband, her two charming, active and hungry boys and one spoiled cat. Efficient Spinster or Desirable Woman? Adopting the guise of a buttoned up spinster is nothing new for Chloe Hardwick. But under the watchful eye of her unnervingly handsome employer, the Marquess of Marland, for the first time Chloe yearns to be unbuttoned! Yet he sees her only as his assistant, the efficient Hardwick-not as Chloe the woman. Determined to escape Braedon's cold detachment, Chloe leaves. And when he pursues her to London, determined to entice her back, Braedon is utterly unprepared for what he finds there--the real Chloe Hardwick. . .
3) Are you cynical? Or an optimist? Can I be both? I believe I'm cynical about somethings and optimistic about other things. I have several of your books on my TBR shelves but I'm always looking to add more! LOL Thanks for the giveaway. That is a big change! Congrats on quitting smoking. Such a difficult but healthy accomplishment! Yes, I think you can be both. I admit there a couple of things in this world that still bring out my cynical side. But I'm always aware of it and try not to let it bleed out into other areas. Hey Deb- I know I put on a mask every now and then especially when I don't feel comfortable in a situation. However, I try to be myself. I haven't really tried to change myself, because I'm pretty happy with myself. I tend to be an optimist. I always try to look for the brightside to everything or put a positive spin on it. Being cynical is not going to make you happy, so why bother. Now that I have kids I try to watch the negative observations I make when I'm around them. I think negativity breeds negativity and I don't want my boys to fall into that vicious cycle. Thanks for sharing your story with us. I have changed my behavior around different types of people in the past, but I'm happiest just being my goofy self. I think we all wear masks and hide our true selves away to some extent. I like to try and be myself as often as possible. My children are all in their 20's now, and for some reason, the things I used to do that embarrassed them, they think are hilarious now. I guess everything really does go around in a circle if life. I have recently read Scandalous Lord, Rebellious Miss and Tall, Dark and Disreputable recently. Really enjoyed both. Thanks! I think we all use masks occasionally. However, the older I get, I think the more stubborn I get. I'm definitely more "Take me as I am" now than I used to be! I think you are right, being cynical is not going to make most of us happy...In fact, it can feel like a mask for unhappiness! Shelley--you give me hope! My two are teenagers now--and in that 'I don't want to be seen with my mom' phase. Thank you! So glad you enjoyed the books! As for change, nothing huge, but I'm trying to smile more--I think my kids have noted that I have "mad face" on too often ;p Oops!! I think you are right, it is a natural instinct, to try to fit in...and yes! Kids are wonderful mood barometers, aren't they? Mine are quick to ask what's up? if I'm being grouchy! I enjoyed the post and I'm looking forward to reading all about "the real" Chloe and how Braedon wins her in Unbuttoning Miss Hardwick. It sounds like a fantastic story. I sometimes hide my true self by staying quiet and not talking to people. I've definitely made a conscious choice to change something about myself - I've lost 50 lbs and I'm so happy I finally did. Congratulations, Barbara! That is a wonderful accomplishment! I hope you will enjoy Braedon and Chloe! We all have masks. I have some that I hide behind. I don't know if you need my email but here it is just in case never know. Very true, Debby--it's all a matter of degree, isn't it? Congratulations to flchen1, the winner of this contest.